Hi friends! Lately I’ve been finding the best deals at Aldi, especially with the new renovations they’ve been doing. They added so much to the organic section and I even found some lentil pasta and honey peanut butter! Though this can’t be classified as healthy (oops) they also have the best deals on candy, which is why I grabbed a package of Kit Kats. I thought to myself, “how can I incorporate these into a baked good?” and the simple (and best) answer is COOKIES. 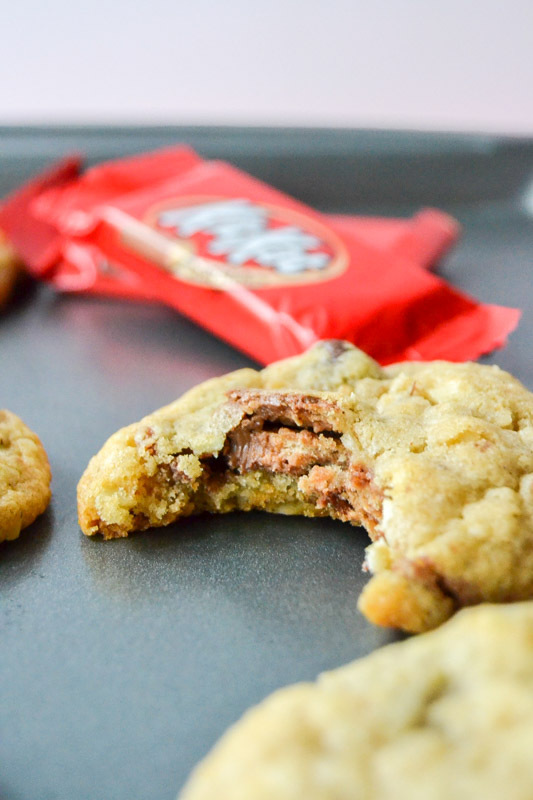 I really just replaced some of the chocolate chips with Kit Kats in one of my favorite chocolate chip cookie recipes. I also replaced the walnut/pecan mixture with cashews, mainly because that was the only nut I had at the moment. It turned out delicious nonetheless! With the added crunch of kit kats and cashews, the texture on these are uniquely satisfying. I really recommend enjoying these warm with a glass of milk. 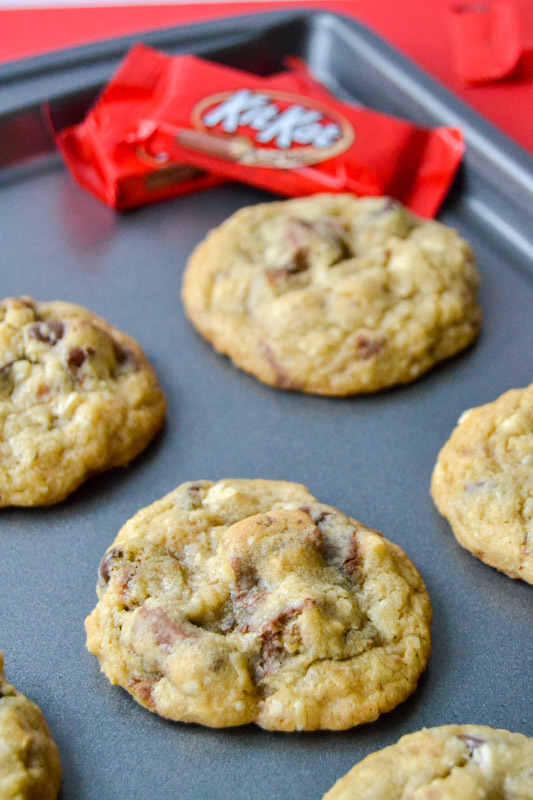 Classic chocolate chip cookies with a twist! Prepare the kit kats: separate kit kats into single pieces, then chop evenly into four cubes. Cream together the butter, sugars, vanilla, and lemon juice in another medium bowl with an electric mixer. Add the eggs and mix until smooth. Stir the dry mixture into the wet mixture and blend well. 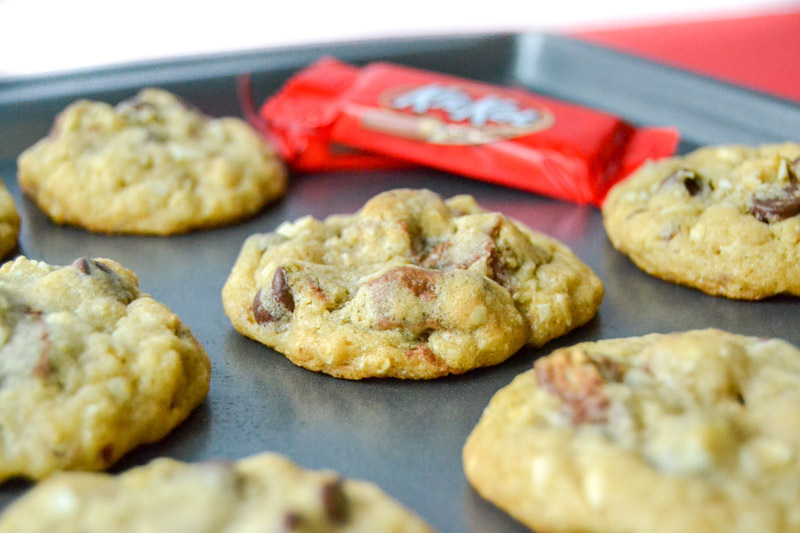 Add the chopped kit kats, chocolate chips, and nuts to the dough and mix by hand until ingredients are well blended. Spoon tablespoons onto an ungreased cookie sheet, or use a cookie scoop. Place the scoops about 2 inches apart. Bake in a 350°F oven for 14-16 minutes or until cookies are light brown and soft in the middle. Store in a sealed container when cool to keep soft. For the best results, chill the dough overnight in the refrigerator before baking the cookies. In my opinion, this is essential to getting that crispy outside, soft inside texture! If you're in a hurry, try to refrigerate for at least an hour before baking.